To read this and several additional updates on Guatemalan adoptions this week, click here. When 2-year-old Diego "slimes" his pet cat Obba with a sloppy kiss and when Andrew and Tatiana begin learning English at ages 5 and 3—there's a big hand helping to bring each of these small joys. In the Woods family adoption, God was in everything: from their decision to adopt through Children's Hope Colombia program to the workings of a new family of five. 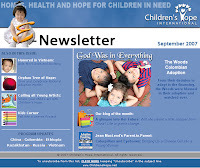 Read the Woods story in the September edition of the Children's Hope E-news. Also in this issue, our Blogger of the Month shares one of her greatest fears and greatest wishes for being a new mother to her daughter waiting in Russia and Jean MacLeod of Adoption Parenting: Creating a Toolbox, Building Connections brings you a personal column, this month on raising your Chinese daughter from a girl in pigtails into a young woman. In our efforts to improve the quality and service to our families inside China, Children's Hope is working with several hotels in Guangzhou. In September, our families will stay at the Garden Hotel. The Garden Hotel is experienced in serving adoptive families during their stay in Guangzhou. The hotel is 15 minutes by car to Shamian Island and is located by several restaurants (including McDonald's, Kentucky Fried Chicken, Pizza Hut and Starbucks) and shopping (for snacks, formula, diapers and gifts). Each room has free internet access and the executive rooms have wireless internet access. Please refer to the Garden Hotel website for photos of available rooms. * The elite room is 32 square meters and can accommodate sleeping for 3 with the addition of a rollaway bed. * The deluxe room, 64 square meters, with a living room is considered a suite. It can accommodate sleeping for 4 with the sofa and additional rollaway bed. * The executive room is 64 square meters and is located on the executive floor. Single, double, queen or king size beds are available and two breakfasts are included with the room rate. Rollaway beds and additional breakfasts are available. The Garden Hotel has free breakfasts for children under 6-years-old. For children ages 6-12, breakfasts are half of the adult price. Today, Ethiopia celebrates its own new millennium. Welcome, Ethiopia, to the year 2000! Ethiopia is the only country which still adheres to the Julian calendar, introduced by Julius Caesar in 45 BC. This calendar includes an extra month, only five days long (unless in a leap year), which over time has placed the country seven years and eight months behind the Gregorian calendar. If not for Pope Gregory XIII who began the Gregorian calendar 400 years ago, we would be celebrating the beginning of the twenty-first century in the United States, too! Ethiopia, in its tradition, will celebrate this New Year today on 1 Meskerem, or September 11, which marks the end of the rainy season and the beginning of spring and all the beauty it brings to the country. The Ethiopian Millennium will be celebrated from September 2007 to September 2008. Today the celebration will jump start with the Grand Millennium Concert, opening ceremonies with 2000 artists and dancers, and the Taste of Addis Africa Festival. The celebration will continue year-round with exhibitions, major sporting events and environmental measures like 2 Trees for 2000, challenging every Ethiopian to plant two trees by the close of the second millennium. We at Children's Hope are excited to be a part of this new century in Ethiopia with our adoption program, and are eager to develop our humanitarian aid efforts in this country. Orphan sponsorship within Ethiopia is slated to begin in October 2007. This month so far, we received a referral for two siblings - a 14-month-old girl and her 3-year-old brother. We were thrilled to be able to refer them yesterday to a Children's Hope family. More referrals are expected soon! Congratulations to this family and congratulations to Ethiopia on this much celebrated occasion! The internet rumor: Additional regions in Kazakhstan are beginning to adapt a 3-trip process similar to that of Kazakhstan region Almaty City. Trip 1 (2 weeks) both parents are required to travel for bonding period. There may be 2-5 weeks between Trips 1 & 2. Trip 2 (2 days) both parents are required to travel for the court hearing only. There may be 2-3 weeks between Trips 2 & 3. Trip 3 (4 days) only one parent needs to travel to personally receive all documents, go through the medical evaluation for the child and complete their US Embassy interview. Trip 1 (3-4 weeks) both parents must travel for bonding period and court hearing. There are approximately 4 weeks between Trips 1 & 2. Trip 2 (2-4 days) only one parent needs to travel to personally receive all documents, go through the medical evaluation for the child and complete their US Embassy interview. Learn more about adopting from Kazakhstan on Children's Hope Kazakhstan Adoption page. A Children's Hope completed family, John and Beth Anth, submitted a video of their daughter Katie to America's Funniest Home Videos. Not long after, they received a phone call—their video was selected as a finalist! On August 18, the entire family, including the Anths teenage daughters Brandi and Amber and the video's star Katie, flew to Los Angeles for the show's taping. You can watch the exciting result on October 14 on ABC. Third place wins $2,000; second place, $3,000; and first place, a whopping $10,000. "Being at the studio was really interesting to see how the show is made," says Beth. "Katie was a ham in front of the camera and clapped and waved when they showed our family. She was as cute as can be! It was a really fun experience for all of us, and of course winning a free trip is pretty awesome!" View the potential winning entry, Stroller Roller, and cheer on one of our own on October 14! * Sixteen-month-old Katie was adopted from China in February 2006. "Document Processing: The CCAA has finished the placement of children for the families whose adoption application documents were registered with our office before November 25, 2005." This group of referrals covered the November 22 through November 25, 2005 log-in-dates. Each family seeking to adopt from China receives a log-in-date upon their adoption paperwork receipt in China; the CCAA conducts an initial review and logs the paperwork into their system. The date that the paperwork is logged in at CCAA is called the log-in-date. Unfortunately, Children's Hope's next log-in-date is not until 11/28/05. Please join me in giving our 11/28/05 and December 2005 log-in-date families a big hug as they continue to wait for their referrals.